I was 50 years of age before I had the courage to do my Psychology Degree. I knew I wanted to be a therapist from the very beginning if I'm honest. Why did it take so long to enrol in university? What held me back? I said that I wanted to have children first. Of course I wouldn't have time to study if I did that. Then I said I wasn't smart enough! And the best excuse of all was that I wouldn't have time because my partner was so busy with his business. Who would take care of the children? The truth is I was just plain scared. Afraid that I would be judged for being a selfish and inconsiderate mother. Ashamed that I was different to other women of my generation and my mothers' generation. But mostly terrified that I would fail........or succeed! Don't get me wrong I'm happy with my life. But I have always known there was something that kept me from following my inner path, not only with my career but in other ways too. Now that I am a therapist I hear the same disquiet sentiments from other women. Bethany discusses the journey that women have taken for so many generations trying to cope and survive in patriarchal societies. She does not decry men. Her thoughtful and compassionate description highlights how 'dysfunctional coping mechanisms' have evolved in womens's lives as they process the pain of not being able to be who they truly are. Webster lists these dysfunctional mechanisms that often show up in our lives. Three of these hindered the path to my degree- a sense of not feeling good enough; remaining small in order to maintain love from my mother and others; and feeling guilty that I wanted to be a therapist instead of being happy with what I had. I have finally fulfilled my dream and I love my family very much. Even so over the years I have often felt lost and wondered who I was. I overcame some of those ingrained painful limitations through paying attention to my own needs; finding a passion and following it, even if I had to leave the dishes in the sink sometimes to do it; and talking to another woman who understood. If you are a working/woman/mother you will understand what I'm talking about. I don't know if I was ever a 'great' mum, but I know that I have given myself and others happiness and peace and love. I don't feel that I need to make others happy anymore. Rather I like to help others make their own discovery of who they truly are. 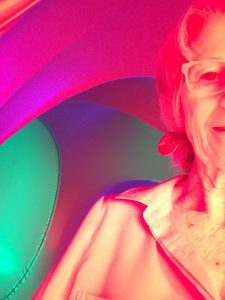 Photo taken at Arboria Luminarium by Architects of Air, designer Alan Parkinson. Horizon Festival, Sunshine Coast University, 2017.